The cost of buying blinis is silly, especially considering how easy they are to make and how much nicer they are than the shop-bought variety. It has to be said, they are a little bit more time-consuming, but they don't require much skill at all as they are basically just Russian yeast pancakes. The traditional topping is smoked salmon and crème fraîche; however, I've decided to make a vegetarian version to cater for all the non-fish eaters over the festive season. Sift together the buckwheat flour, plain flour and salt into a large bowl, then sprinkle in the yeast. Put the crème fraîche and milk in a saucepan and heat it until it is just lukewarm - if it is too warm it will kill the yeast. Then whisk the egg yolks into the milk and crème fraîche and pour the liquid into the flour mixture. Beat everything together until you have a thick batter, then cover the bowl with a clean tea cloth and leave it in a warm place for about 1 hour – I put mine in front of a warm radiator as I don't have an airing cupboard. After an hour the batter will be spongy and bubbly. Next, whisk the egg whites into stiff peaks and fold into the batter. Recover with the cloth and leave as before for another hour. The batter should still be bubbly and faintly warm. Now, to make the blinis. Heat a frying pan with a teaspoon of olive oil and wait until it gets really hot. Then spoon just over half a dessertspoon of batter per blini into the pan and fry for about 20-30 seconds on each side, so they are cooked and golden but not burned. I did about 3-4 blinis per each time in the pan. You will need to add a little more oil after each batch or the blinis will stick. To make the topping, finely dice the mushrooms, then quickly fry to seal in the juices. When half-way cooked, crush in the garlic and cook for a further couple of minutes. Season with salt and pepper then stir in the crème fraîche. 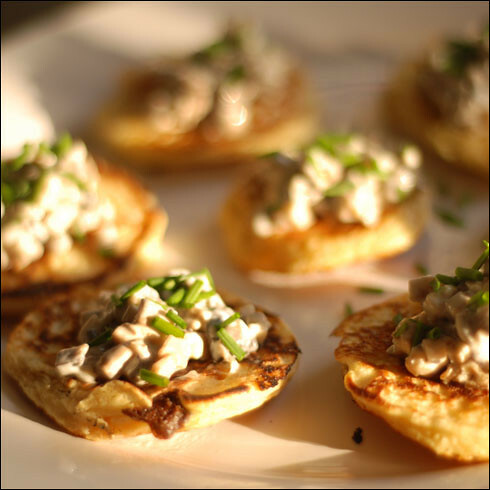 Dollop a teaspoon of mushroom on each blini and top with a sprinkling of chopped chives. Serve immediately with a glass of prosecco.